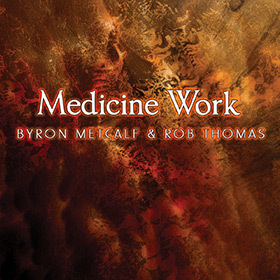 Award-winning shamanic-trance drummer Byron Metcalf and master didgeridoo artist Rob Thomas of Inlakesh combine their musical and personal medicines to create an extremely potent sonic brew. MEDICINE WORK is a call to the deep journey. An invitation to explore vast mysteries of Initiation & Rites of Passage; Alchemy & Transmutation; Transformation & Transcendence; Cycles of Death & Rebirth; realms of the primordial, archetypal & mythological. The journey concludes with the safe return Home to the harmonic resonance of the traveler’s Heart and True Nature.